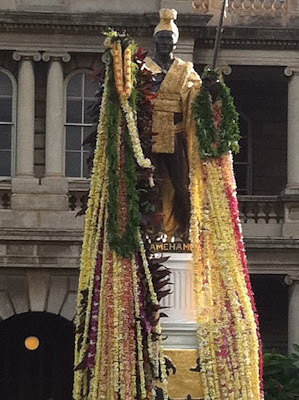 Last Friday was Kamehameha Day, a state holiday commemorating King Kamehameha The Great’s birthday and celebrating the cultural traditions he defended. We were warned of traffic gridlock in Waikiki due to parades, festivals, dances, concerts, etc, associated with Kamehameha Day. Recognizing we would miss a cultural event, Mark and I decided to stay away from the throngs of people and pass on the festivities. Friday evening, we needed to show up somewhere on the outskirts of Waikiki. We consciously waited for the traffic to leave the area of Ali’iolani Hale, (the building behind the statue of Kamehameha) and for crowds to assemble further down in Waikiki for the next promoted event of the day. We figured we’d drive slowly past the statue to see the draped leis done earlier in the day, then continue to our destination. The streets were nearly empty as we drove up to the statue. A few dozen people stood, some taking photos of their family, in front of the newly lei’d King. With plenty of parking spaces, we decided to stop. 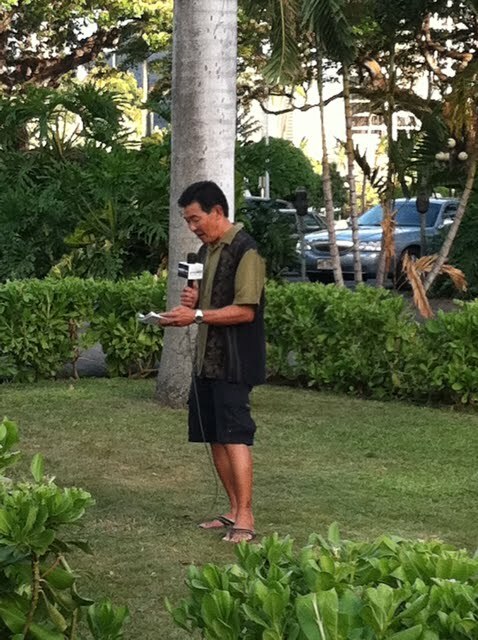 We saw Guy Hagi, the local weatherman, reporting from the scene. About thirty men and women dressed in Victorian era clothing stood in front of Ali’iolani Hale, the former seat of government for the Kingdom of Hawaii. We stood on the outskirts of the paved circle that surrounds the statue as Hawaiian men and women paraded on the circular pathway, chanting; a few carrying torches, one waving a smoking ti leaf and nodding to a few in the crowd. The woman standing next to me touched her hand to her forehead and bowed when the ti leaf waved our direction. I assumed she was Hawaiian, although here everyone is such a mix of different races and nationalities, it's difficult to tell. Mark and I stood quietly trying to remain out of the way of the ceremony, but no one seemed to mind if we watched. I whispered to Mark that I wish I spoke Hawaiian so I could understand the meaning of this ritual. Near the end of the ceremony, the group around the statue sang a haunting, but beautiful, melody. I quietly asked the woman next to me if she knew the name of the song. “Kamehameha,” she answered. I didn’t ask her any more. Her eyes were fixed on the group. She started to whisper in English as the group sang. “I’m translating,” she said. I wish I could remember word for word what she translated, but it was about having respect for the king who unified the islands and how they will always revere and remember him. I asked who the people were who performed the ceremony. Astonished that Ali’I still existed, she sensed I wanted to know more. 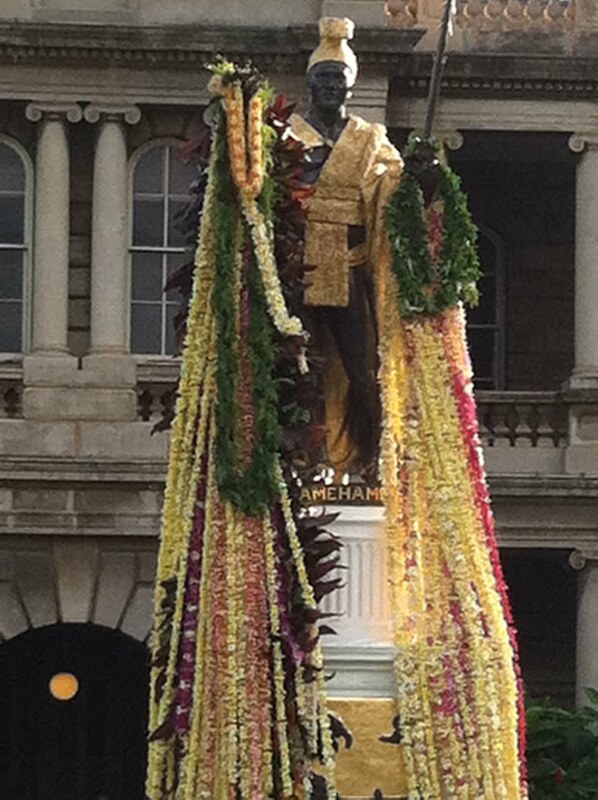 The Sons of Kamehameha were the men holding the torches and wearing cardinal red and black capes over their suits. I wished to know more, but I didn’t know what to ask and I didn’t want to take up this woman’s time. Just then, she faced me, leaned towards me to touch her forehead to mine. She touched her nose to mine. Quietly, she said, “Breathe in the essence of the other person.” We both inhaled, then separated. “I am,” I said. “I’m here because he’s such a kind and caring person.” I hugged Mark and told him how grateful I was he brought me to Hawaii. 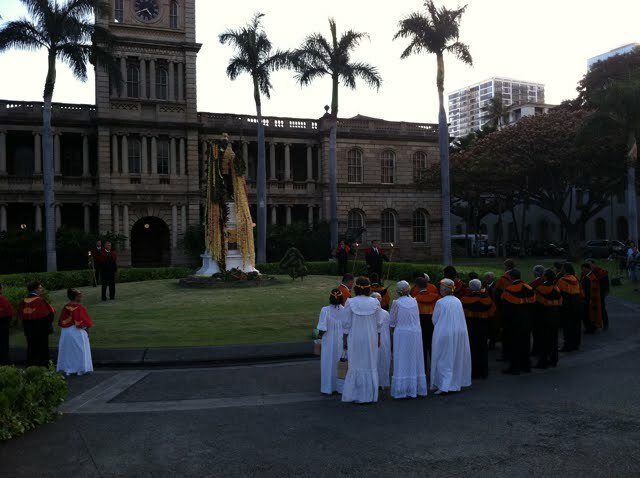 She told me of a queen, about May Day and the meaning of its celebration here, of the spirit of the Hawaiian people. I tried to remember it all and soon realized I'm not supposed to remember the facts, I'm supposed to live in Aloha, the way this woman was describing it to me. Then, I turned to the woman, leaned in, touched my forehead and nose to hers, and breathed deep. I stepped back, looked her in the eyes, nodded slightly to her and in sincerity said, “Aloha”. I must have blinked taking in the moment, because after that, she disappeared. Ua mau ke ea o ka 'aina i ka pono "The life of the land is preserved in righteousness." Wow, it's been a long long time since I saw that statue. I vaguely remember an event such as this many years ago. Next time you visit, go see the King. My rememberance of the history of Kamehameha is that he was quite violent in how he unified the Islands, even killing his own brother. Hawaiian example of peace through strength because there were years of peace and stability that followed. Doesn't quite matter because Aloha is universal. I loved your post. John, I learn more and more every day about these islands. This was the first time I was taught from a Hawaiian, not a book or museum blurb on an artifact or photo. Kamehameha was violent. We take visitors to the Pali and let them read the description of what happened there. He seems so lifelike still. We're heading to his birthplace on the Big Island soon. More to see and learn here!